[#486] And What Of My Soul? WOW, it has been some time since I’ve done a “fantasy” type blog post. Pulling this together took more than I want to go over the details of considering that there were several outfit changes (not by me personally but for Brena) to make this come to life (or is that unlife?) Image Essentials released a group of different poses that focused on vampires and this is a topic I’ve always been interested in that began when I was much younger than I am today. Whether it is books, movies, or even rpg’s or video games that have to do with these creatures, be sure that I’m all in (though I’m not the biggest fan of Twilight because vampires do not sparkle…sorry!) It even reminds me of something some of you in-world might have heard of called Bloodlines. When I first started out my virtual journey I remember the game/rp and I entertained the idea of getting involved with it but the more research I did, the more I found out what a blatant money soak it was and for me there wasn’t enough of a TRUE role-play experience for me so I took a pass on it. I come from a very extensive RP background well before my time in this virtual world and felt that I would be selling out to something I felt was against what I stood for creatively. There are some of you that might have played it (or still do if it is still a thing) and if I have offended you then I apologize sincerely but I do not feel like there is anything wrong with having a difference in opinion. During the process of staging the photo and getting everything prepared it helped that several products other than the “Bloodlust” bento 2 person pose by Image Essentials. 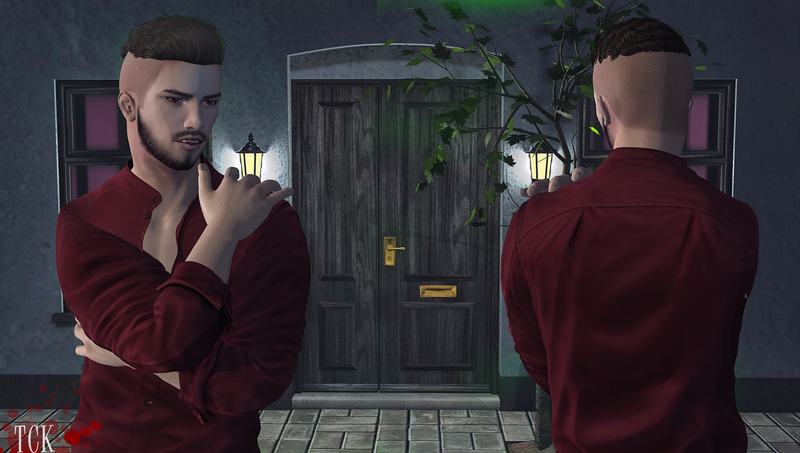 Go&See’s latest skin “Theo” is also available at Men Only Monthly and let me tell you when it comes to skins that allow an avatar to look gothic or vampiric, Kristyna Wikifoo does the best job. I’ve used the “Goth” tone of skins by Go&See for several photos and they’ve all come out the way I’ve wanted. With the way the lighting came together I certainly have the undead creature of the night down pat. Besides the Goth applier (which includes two HUDs for both CATWA and OMEGA), the skin is also available in Pale. Summer, Tan and Dark Tan and feature options for brows/no brows as well as facial hair options mixed in. The body skins are sold separately for OMEGA compatible bodies and only work with the latest versions of Go&See products. Men Only Monthly runs from the 20th of April until the 15th of May so there is still plenty of time to check it out. FaMESHed is also back again and for those of you fortunate enough to have been able to make it in there you’ve seen plenty of new fashion, accessories, and decoration. It was a fruitful trip for both myself and Brena as we both found new items to use in our wardrobes as you are about to find out in a moment. The event is celebrating it’s 6th anniversary which seems CRAZY to think it has been that long since the very first event took place. Even before I started blogging I still was very much into all sorts of things like furniture that I could find at the event so it’s really great to see it still going strong with so much support. Once again I’ve been hit by the Deadwool bug. Their latest item at FaMESHed is the “Lorenzo” shirt which is a half buttoned tucked in shirt that gives you the option to wear it with or without an undershirt both of which can be colored by HUD if you’ve purchased the FATPACK (which is the only real way for me despite the elevated cost). If the FATPACK is just a little bit out of your limit there are three different packs (Light, Medium, and Dark) that you can certainly get your fill if there’s a certain grouping of colors you can’t live without. I do see myself wearing this shirt in different stylings over time so it validated my choice of going all the way and getting the FATPACK. Finding the right dress that really worked with the theme was definitely a challenge for me to get Brena ready but while I was at the FaMESHed I came across the “Embroidered Strap Bodycon Dress” by Rebel Gal. I chose the wine color because it matched the red highlights in her hair and so I coordinated her dress to that and it worked out perfectly. The dress has two faces to it (the shirt and the dress itself) and an included HUD allows for you to change the color of the top with a variety of different options so that you won’t have to worry about it being stale after a while for those of you who like to wear things more than once (and I hope you would otherwise it would be a gross misuse of funds). With my last new piece of my look (to which I am slightly behind but am going to be caught up with very soon and humbly apologize) I have a very recent hair release from Modulus which is named “Mateo”. It’s a short length hair that I personally think would work best with a shaved base but you can still go with a normal base if you are not truly a fan of the shaved style. As with previously releases there are 25 different colors divided into 5 HUDS (all 5 are available in a FATPACK to save you some dough) and each one has an integrated color tinting section to give you unlimited options. This item can be found at the Modulus store as well as online at their marketplace location both of which you will have access to down in the credits below.